Real Madrid boss Zinedine Zidane has defended his decision to substitute Cristiano Ronaldo early in their match against Atletico Madrid yesterday. Real Madrid were one goal up when Zidane took off Ronaldo after the hour mark. Many supporters were surprised and it wasn't long after he was substituted that Antoine Griezmann draw Atletico Madrid level. 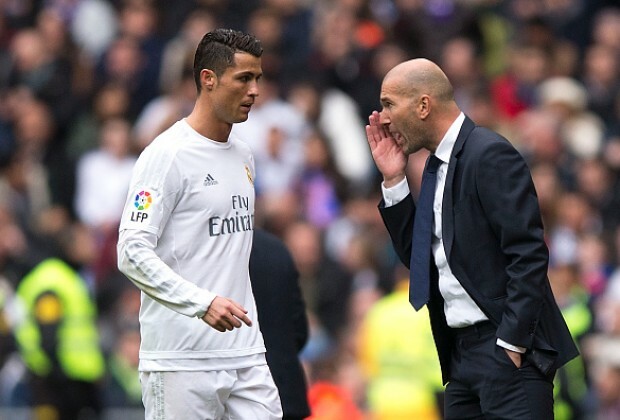 Zidane has now insisted Ronaldo needed a break and he had to take him off. "Cristiano is Cristiano, he has been this player all his life, scoring 50 goals a season," he said. "It is true that there is nobody else who does that. But others can score, have done recently, and we must think about the positives." "It's better to have Cristiano with us. It was just to rest. We have many games, that's it." "Sometimes he needs to rest. These days he needs that. He feels better every day, you can see it." The match ended in a draw [1-1] and Madrid remain 4th on the La Liga table, though they still have the chances of qualifying for Champions League next season but they have to get maximum points in their up coming games. Do you think Real Madrid will book a place in the Champions League next season?